Galvanized gutters are durable and reliable and you can rest assured the rain water will not be able to penetrate the foundation of your home through the gutters. This ensures the rain water your home receives, regardless of the level, is drained away. If the rain water seeps into the foundation, it can cause immense damage, which could cost you thousands of dollars to repair. A significantly smaller investment in galvanized gutters can save you unnecessary repair and renovation costs in the future. Your yard or lawn will be safe from excess water damage, even in case of storms. This is because the galvanized gutters will collect the water and then direct it towards a dry patch where it will be absorbed. This will prevent soil erosion, which often requires you to replace your entire lawn in case it rains heavily. 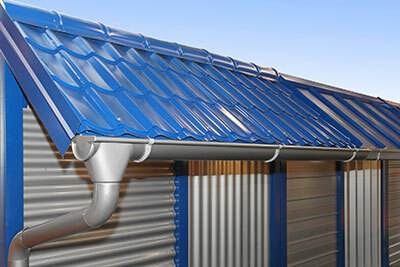 Galvanized rain gutters are available in a wide range of colors. You can select one which goes well with the color of the exterior walls of your home. This way, the galvanized gutters prove a seamless addition to your home and in fact, add to its visual appeal. Despite this, some homeowners in San Antonio assume installing rain gutters will affect the curb appeal of their property significantly, but this is not the case if you opt for galvanized gutters. Did you know that homes with galvanized rain gutters installed sell for a higher price than their market value? This is because prospective buyers will consider the fact that you have taken good care of your home by investing in galvanized rain gutters and this will convince them to pay more. These are just some of the benefits of investing in galvanized rain gutters. At San Antonio Rain Gutter Pros, we have the expertise, experience and equipment to install rain gutters perfectly so that they serve their purpose and protect your home from damage because of rain water. Moreover, you can discuss your long-term needs and sign up for an extended maintenance program. In case you are worried about the cost, call us up now and schedule an appointment. We will send over our experts to inspect your property and assess your requirements. Based on their assessment, they will provide you an estimate for the galvanized gutters and our service charges. This way, you can make an informed decision. Do keep in mind in mind that there is no obligation on you to hire us!